This is the 2nd post of Skin pH series: Read the 1st post on Understanding Skin pH and its Impact here. We are privileged to have Board Certified Dermatologist Cheryl Lee Eberting, M.D. again for this 5-week skin pH series. Read more on Dr Cheryl Lee here. Dr. Eberting invented the TrueLipids skin barrier optimization and repair technology; a technology that helps the skin to repair itself by recreating its own natural environment. MarcieMom: Thank you Dr Cheryl Lee for helping us understand skin pH – we learnt last week from you that skin pH impacts lipid-producing enzymes and skin bacteria. Today, we aim to understand what would happen in an overly acidic or alkaline skin! MarcieMom: I read that the acid mantle is beneficial to skin due to (i) reduction of moisture evaporation from stratum corneum (upper skin layer) and (ii) discourage bacteria and fungi growth. Conversely, a more alkaline skin pH is prone to dryness and encourages growth of pathogens (from M.symphodialis) that promote skin inflammation. Moreover, skin pH affects Sphingosine production (a skin lipid) that in turn, also impacts skin flora. This is all quite confusing! Can you explain if our skin can be over-acidic or over-alkaline? And if yes, how does it impact our skin structure? Dr Cheryl Lee: Our skin can be overly acidic, or it can be in the optimal range of 4.6 to 5.6, or it can be overly alkaline. 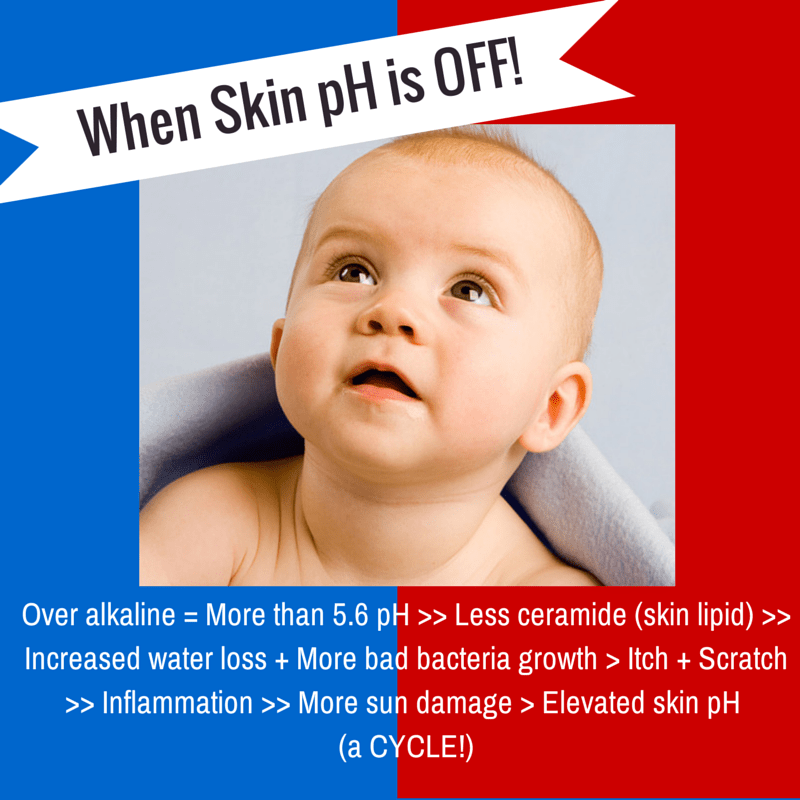 When there is any sort of epidermal disruption such as seen in eczema, a rash, an infection, inflammation, or when the skin comes in contact with soap, bleach or even tap water, then the pH of the skin becomes overly alkaline. This is when pH of the skin exceeds the optimal lipid-producing range of 4.6 to 5.6 and the ceramide-producing enzymes slow down or stop producing ceramides. With decreased skin lipid production, the skin loses water more rapidly and becomes dried out and more itchy….then we start to scratch and bacteria are introduced which then leads to an elevated pH and inflammation. This leads to an ever more elevated pH and more inflammation and the rash that we call atopic dermatitis. Again, you can start to understand that the Itch Scratch cycle is more than just itching and scratching. Ceramides are only one of the lipid species in the epidermis, but are very important in preserving the antimicrobial functions of the skin as well as preventing loss of water from the skin. Fatty acids are also an important group of lipids that are involved in contributing to the natural acidity of the skin barrier and to the skin’s ability to discourage growth of unfriendly bacteria. Studies have shown that “hyper acidification” of the skin barrier (down to 3.5ish) with polyhydroxy acids (gluconolactone and lactobionic acids) may actually be beneficial and may hasten skin barrier optimization. Interestingly, another acid, 18-B glycyrrhetinic acid, can also help to optimize the skin pH, and importantly, it has also been shown to be effective at controlling Malassezia species from overgrowing on the skin. These three acids are the acids that I prefer to use on the skin for these reasons. We do know that hyper acidification with other acids such as citric and lactic acids can be more irritating to the skin barrier due to their propensity to turn into a salt once applied to the skin. If the skin barrier is really excessively acidic (i.e. a pH less than 3.5), it can be physically destructive to skin tissue (a chemical peel) and will break it down. I think it is best to stay as close to 4.6 and 5.6 range, however, it may also be beneficial to be slightly more acidic than this. Dryness—not enough lipids are being produced. Is the above correct? Moreover, we know that skin conditions are often multi-factorial, so is it over-simplistic to attribute the skin’s pH to a skin condition? Dr Cheryl: Overly alkaline skin is indeed associated with dryness, increased sensitivity, being more prone to sun damage, eczema and acne. Overly acidic skin doesn’t usually happen unless an acid is applied to the skin to change the pH as is the case when we do a chemical peel on the face and indeed, a chemical peel will make your skin more sensitive to the touch, more red, inflamed and painful, but these symptoms are usually short-lived and will resolve once the skin has repaired itself from the chemical peel. Interestingly, we do know that ceramide production is pH-dependent and we do know that ceramides are involved in controlling matrix metalloproteinase (MMP) production. The MMPs in the skin are involved in regulating and controlling inflammatory responses after sun exposure and can lead to the breakdown of collagen and elastin. For this reason, ceramides are important after sun exposure, and the pH is important for ceramide production. Also very important is the role of the pH in eczema prone skin where there is a disrupted skin barrier which results in a rash, and there is infection/colonization from Staph. aureus. Thank you Dr Cheryl for being ever so patient in enlightening us about the skin pH. Next week, we will focus more on our diet and skin pH, something practical that parents can work on for their eczema kids. Mom NeedyZz Cartoon – ‘Expecting’ Dads Get Tired too!